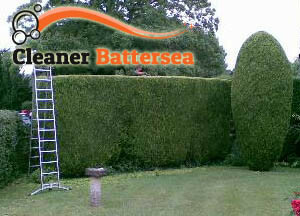 We are qualified specialists, committed to providing expert hedge cutting throughout Battersea and the surrounding area. We believe you should book our services if balancing between your work appointments and house chores prevents you from caring for your hedges as regular maintenance is required to keep them dense and compact. It also furthers their healthy growth. We are always at customers’ disposal, charge reasonable prices and employ a team of motivated, referenced and skilled gardeners who will meet all your hedge-related needs. As we are available on short notice, feel free to call us any day and we will send a team of expert gardeners on a free inspection. They will reduce the height of your hedges to the desired size, but if you are interested in more aesthetic topiary work, please do share your requirements with the gardeners as they are always happy to comply with customers’ individual requests. Once done, the team will readily dispose of all trimmings shed in the process, leaving the site neat and tidy. As we are specialists in all hedge-related services, we offer some additional work upon customers’ demand. For instance, if you have any old shrubs you want removed from your garden, our team will readily undertake this task. We also provide coppicing services since cutting back the hedges to ground level can greatly stimulate their growth. 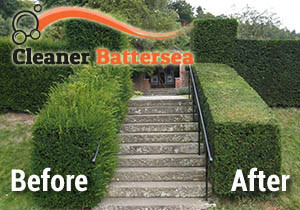 If you want your hedges to be denser, healthier and more compact, consider booking the hedge trimming service we provide in Battersea, SW11. We are available for single visits or regular maintenance. Give our friendly assistants a call to receive your free quote now. We look forward to hearing from you!